Just when everything was going well and everybody was happy something from their past catches up with them. To their dismay they were torn apart, drifting away from each-other. It changed their destiny forever. 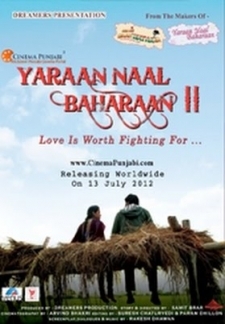 © 2018 Scratchu.com Yaraan Naal Baharaan 2 | Goldie Sumal, Rishita Monga, Vikramjeet Virk, Yograj Singh, Jitendra Rose Kaur, Balwinder Begowal, Balwinder Kaur Brar, Parminder Gill, Shavinder Mahal, Aman Sutdhar, Prince Kanwaljit Singh, Malkeet Rauni, Rakesh Dhawan, Labh Chatamliwala, Kul Sidhu - Yaraan Naal Baharaan 2 (2012) | Punjabi Movie | 7.6/10 | Synopsis : Just when everything was going well and everybody was happy something from their past catches up with them. To their dismay they were torn apart, drifting away from each-other. It changed their destiny forever.... Watch Online!! !